Abstract medical background with DNA helix, genetic code and mosquito sucking human blood. Concept for mosquito genetic and gene editing technology (CRISPR-Cas9) to control mosquito populations. 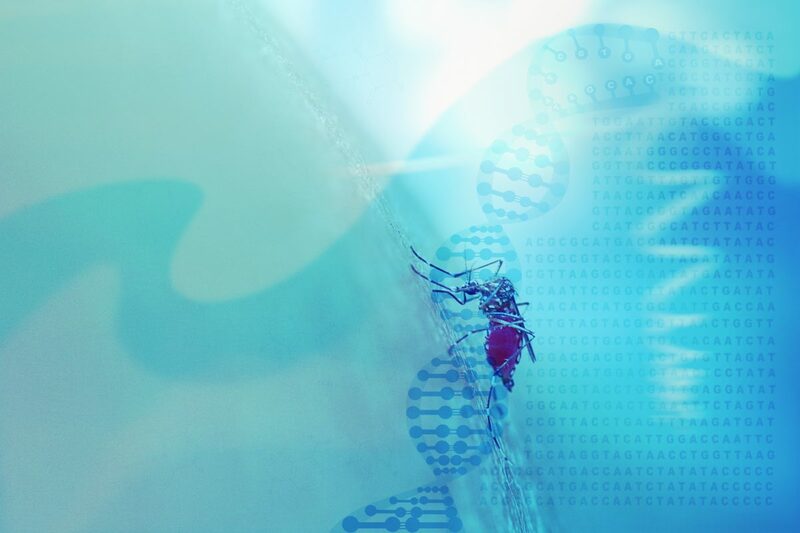 A new gene drive system introduces gears well suited to the transmission of relatively slight genetic variants, that is, allelic variants involving only one or a few base pairs. Typical gene drive systems are configured to copy relatively large DNA cargo sequences. The new gene drive system—or allelic drive system—favors or disfavors selected alleles and promises to accelerate the assembly of complex genotypes, which may consist of “point-mutant alleles in combination with insertional transgenes for a multitude or research and applied purposes,” said its creators. The allelic drive comes from the laboratory of Ethan Bier, PhD, a professor of cell and developmental biology at the University of California San Diego (UCSD). According to Bier and colleagues, the allelic drive is equipped with a guide RNA (gRNA) that directs the CRISPR system to cut undesired variants of a gene and replace it with a preferred version of the gene. The new drive extends scientists’ ability to modify populations of organisms with precision editing. Details of the new system appeared April 9 in the journal Nature Communications, in an article titled, “Efficient allelic-drive in Drosophila.” The article describes how Bier’s team tested two configurations for allelic drive: copy-cutting, in which a nonpreferred allele is selectively targeted for Cas9/guide RNA (gRNA) cleavage, and a more general approach, copy-grafting, that permits selective inheritance of a desired allele located in close proximity to the gRNA cut site. Although demonstrated in fruit flies, the new technology also has potential for broad application in insects, mammals, and plants. According to the researchers, several variations of the allelic drive technology could be developed with combinations of favorable traits in crops that, for example, thrive in poor soil and arid environments to help feed the ever-growing world population. Beyond environmental applications, allelic drives should enable next-generation engineering of animal models to study human disease as well as answer important questions in basic science. “Forcing species to return to their natural sensitive state using allelic drives would help break a downward cycle of ever-increasing and environmentally damaging pesticide over-use,” noted Annabel Guichard, PhD, a project scientist in the Bier lab at UCSD and the paper’s first author. Lethal mosaicism dominantly eliminates NHEJ-induced mutations and favors inheritance of functional cleavage-resistant alleles.